The Sago Palm has shiny dark-green leaves with a rigid mid-rib and glossy leaflets that curl along the edge growing in a circular pattern. The trunk is thick and shaggy, much like a palm tree. 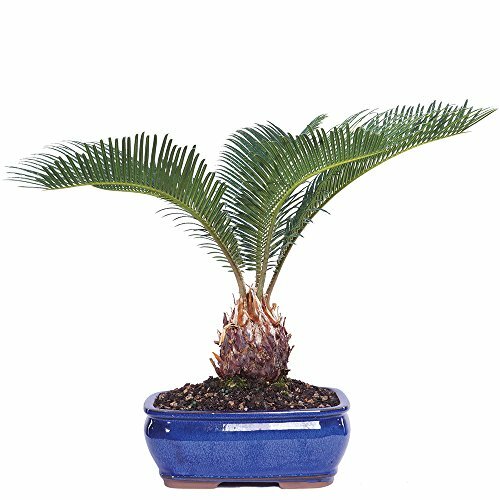 Regardless of age or size, Cycas revoluta is one of the easiest Bonsai plants to grow, indoors or out, by beginner or expert. This subtropical adapts to a wide range of temperatures from 15 to 110 degrees F (-11 to 42 degrees C), accepts full sun or bright interior light, thrives with attention, and tolerates neglect. SPECIES: The Sago Palm has shiny dark-green leaves with a rigid mid-rib and glossy leaflets that curl along the edge growing in a circular pattern. The trunk is thick and shaggy, much like a palm tree.